Chapter 1: Welcome to Planet Football. Chapter 2: The Ball Starts Rolling: A Potted History of Football. Chapter 3: Getting Your Boots On: The Gear You Need. Part II: Playing the Game. Chapter 4: Laying Down the Laws. Chapter 5: Players, Positions and Tactics. Chapter 6: Honing Your Skills. Chapter 7: Keeping Fit for Football. Chapter 8: Coaching, Managing and Leadership. Chapter 9: Getting the Game On. Part III: Exploring the World of Football. Chapter 10: The World Cup. Chapter 11: Surveying the International Scene. Chapter 12: The Club Scene. Chapter 13: Focusing on Famous Clubs. Chapter 14: Women s Football. Part IV: The Fans Enclosure: Following the Game. Chapter 15: Going to the Match. Chapter 16: Compulsive Viewing: Football on Screen. Chapter 17: Read All About It! 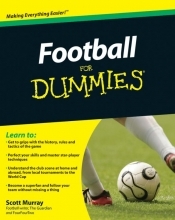 Chapter 18: Other Football based Pastimes. Chapter 19: Ten Great Players. Chapter 20: The Ten Greatest Teams of All Time. Chapter 21: Ten Great Matches. Appendix A: Roll of Honour.